AV Stumpfl launched their next generation Wings Vioso RX software at Integrated Systems Europe 2016. Aimed at quick and easy adoption for existing users, the familiar user interface has been given an extensive facelift with several performance and feature optimizations. 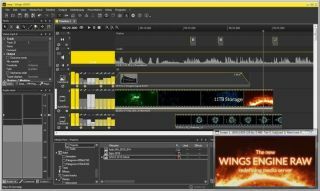 “The render engine inside Wings Vioso RX is completely rewritten from scratch and is the result of an intensive five years of product design, development and beta testing,” said Fred Neulinger, technical director at AV Stumpfl. “Show creators using Wings Vioso RX will benefit from the most accurate, perfectly synchronized and jitter-free content processing and playback,” said Neulinger. Another key feature is the introduction of AV Stumpfl’s brand new proprietary multiple master workflow. In real-time and regardless of physical location, multiple operators can work collaboratively on projects using the same media server outputs. This means that one operator can control background projection whilst another can add overlays or add or change content live at runtime, even whilst the show is running. This new workflow also provides a multi timeline functionality which allows users to run concurrent timelines – synchronized or not – on the same system and on any number of layers. AV Stumpfl has updated their media server portfolio to include a complete new range of products from sleek entry level media servers for fixed installations up to AV Stumpfl’s flagship product, Wings Engine Raw. All servers include Wings Vioso RX software. AV Stumpfl has taken Wings Engine Raw to a new level with full 8K (8x4K@60fps) uncompressed content playback and incorporation of Wings Vioso RX at its core. It was demonstrated at Integrated Systems Europe 2016 on the AV Stumpfl stand as well as several partner stands. “There’s no better place to launch Wings Vioso RX software than at ISE 2016. Visitors came to the stand and were able to try, test out the software and plan for future investments,” concludes Neulinger.